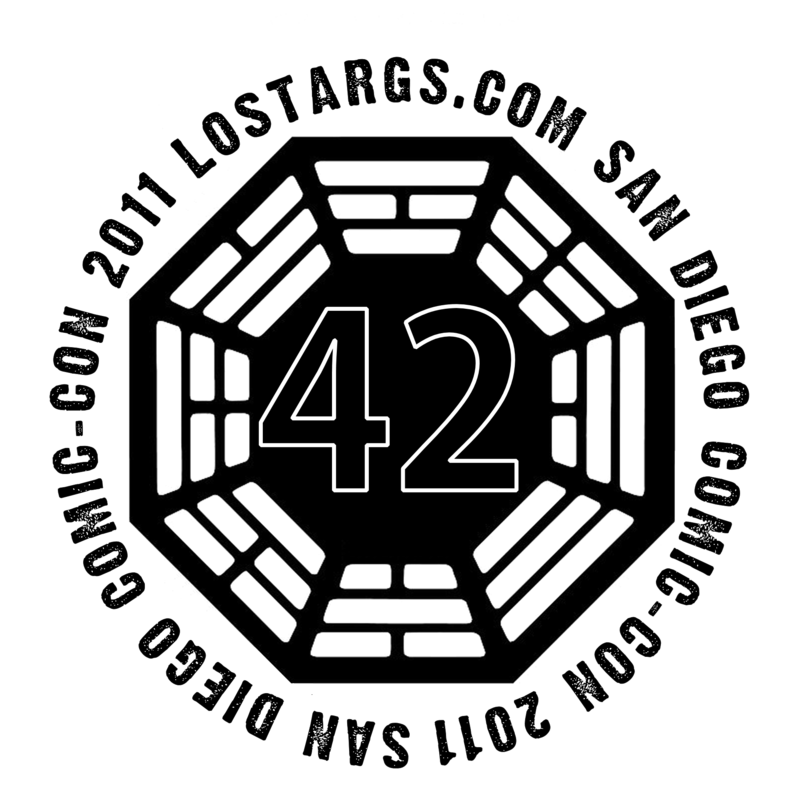 As you may know several LOSTARGs regulars have already purchased tickets and we will all try and meet up during Comic-Con to swap stories about LOST, Damon Carlon and a Polar Bear and everything else that has happened over the last few years. Edited - As Cafe Press have decided they do not like what we created (please feel free to let them know what you think !) all we can really do is give you the artwork and let you choose where you want to create your merchandise. Click on each image for the large version which is a .PNG file. Could be used for a pocket logo. The same design above but smaller, suitable for a mug. This is an inverse logo with a transparent background suitable for a black or other coloured item of clothing. This is a large (suitable for t-shirt) logo with partial transparency. The Bagua sections are transparent and the main background but the number 42 is white. Zort: Those items are awesome...definitely gonna get me some tees! Comic Con reunion is going to be fantastic! BTW: Best of luck to those trying (AGAIN) for tickets tomorrow! Thanks Maven, I hope they look as good when Cafe Press prints them. I am trying to resist odering one of each just because I'm curious about how they will look in real life. Do we know if anyone still needs help in getting any tickets ? Cafe Press have just removed my images saying they infringe one of their rules. I'll see if I can find out why. I don't know if it's the web blocking at my work or not, but when the LostArgs store comes up at Cafe Press... I don't see any items there. :-( Is anyone else not seeing products, or is it just me? I definitely need some "proper" attire for Comic Con! LOL! Ah... looks like our posts crossed. LOL! Didn't Cafe Press have that agreement with ABC for fans to be able to sell their own self-created items? I'll have to look that one up... I'll let you know what I find. I think it was the .com that was causing the problem. I've removed the .com from most of the images, we will have to see if that is more acceptable. The blogger post and the shop should be restored now. Cafe Press have now removed the second set of images. Having sold on Cafe Press for some time I can say they do in fact have agreements with many different companies. These agreements allow sellers to create items with "intellectual property" of said companies, ie you can use logos, sayings, names, dialogue, etc. ABC was in fact one and I personally was able to sell some shirts I'd created earlier with items like the Dharma logo, character names, pieces of dialogue, etc. This of course was last year, so the rights may have changed by now? But when I bought items off the ABC store well after the show was over, they were still promoting Cafe Press on the site. In fact, my items showed up in the ABC website search, which was awesome!! I did a little research and discovered that since ABC had so few items left, they were linking the Cafe Press site, ie a win win situation for both. One thing I will say is that you had to follow their rules pretty close. One stipulation was that you had to put certain tags on the items. I wanna say they were ABC and Lost among others. This possibly could be your issue. If you didn't tag them right, ie if you left out even one of the required tags they would refuse the submission. Cafe Press is normally pretty awesome. They usually don't freak out over parody items or random stuff from TV/movies that's tongue in cheek and not a direct/blatant rip off. Zazzle is a POS and after hassling with them for repeatedly deleting NON copyright items I stopped using them completely. I refuse to sell or buy through them now. Well there seems to be 1 shirt up at present. They canned the rest (that I didnt even see)?! Ok, lets cut out the middle man and do things our way. I haven't given up on Cafe Press, but for now I'm going to let them sulk until they decide to do the decent thing. I've updated the main post to include links to the original image files so you can download your own version and create whichever personalised items you want to. Very cool! Like the designs. Dunno what's up with Cafe Press. I can't see anything wrong with them. Weird. Thanks Team Jack, I home you like the new version of the 42 on it's own logo. The one I re-uploaded to CP last night was a rush job as I was getting annoyed. Ooops, meant hope not home ! Oddly enough I've never had a problem with my LOST Street Fighter design at CafePress. http://www.cafepress.com/Room23 I'm curious what their problem with your awesome design could be? *Lightbulb*! Think I'll have all residents of The Barracks sign it! 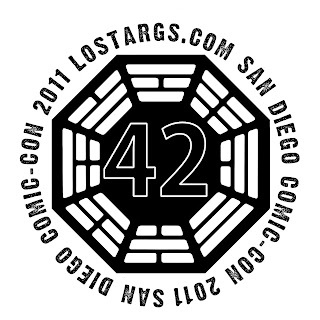 It will make a very cool keepsake of SDCC 2011. Update: just now received shipping notice from CafePress, and the shirt is on its way. Love the designs Zort. Think I have tickets-though actually going once again depends on health of family members and such. Is there any problem with having Comic-Con written on the shirts-does Cafe Press need to have an agreement with them? hey zort i have a question for you if you can email me at thaeagle2003@yahoo.com that would be great. Zort. I wouldnt mind trying to make a design for a shirt (for myself only!). Do you have .psd files for the 3 types of bagua (white back/black back/inverse transparent back) that I might be able to download to get me started? Or can you direct me to a site that has them, as Ive had no luck searching for them. Thanks! Cafe Press have responded and say it is the mention of Comic Con that is the problem. The thing that annoys me is that the images have been on the Cafe Press servers for a month and a half, but the moment I announce them they take them down. hey zort i was wondering if you had received my email.